Forcing European companies to store phone and internet records is among anti-terror measures agreed by EU interior ministers. 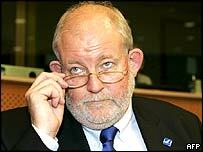 UK Home Secretary Charles Clarke chaired an emergency summit on terror measures after the London bombs. He said there was unanimous agreement that EU nations must do better and "cannot delay in getting this right". People across Europe will also be asked to observe Thursday's two-minute silence for the London victims. The tribute will take place at 1200 BST. After the talks in Brussels, Mr Clarke said: "All of us across the EU are absolutely determined to accelerate work to make terrorism more difficult. "It focuses around a wide range of different exchanges of data and information." Mr Clarke said progress had been made on agreeing the "substance" of plans to force European phone and internet firms to keep records of calls, text messages and e-mails. BBC Europe correspondent Tim Franks said it was still unclear how law enforcement agencies would be able to access the data - and whether the scheme would be overseen by the European Parliament. UK companies already store data for a year under a code of practice and Mr Clarke wants the scheme rolled out across Europe. Critics of the idea say it is too costly and it will take too long to search the mass of stored data for the move to be useful. Italian MEP Lilli Gruber said: "Once you are monitored with your private telephone calls, telephone messages and private emails, this is a police state." But Mr Clarke said telecommunications data was important in investigating whether the bombers were part of a broader network. He also rejected claims that a UK minister told French politicians that some of the bombers had been arrested by police last year. A new effort to stop the recruitment of potential terrorists. In a statement from the summit, the ministers said the bombings were "an affront to universal values on which the European Union is based". They added: "The terrorists, who reject that commitment and seek to use violence to impose their ideas, will be defeated." EU interior ministers gathered for a similar summit after March 2004's Madrid bombings which killed 191 people. That meeting led to the faster implementation of the European Arrest Warrant and boosted the sharing of police information to thwart future attacks. UK ministers now want that action plan to be implemented in full as quickly as possible. EU Justice and Security Commissioner Franco Frattini suggested it was time to "blame and shame" nations which had failed to implement the previously agreed measures. Mr Clarke also faced questions about the implications of the plans from the European Parliament's civil liberties committee. One MEP said introducing measures which sounded tough did not mean they would be effective. And the former deputy chief constable of Greater Manchester Police, John Stalker, said he did not believe the new measure would make any difference. "I don't think that there's anything that politicians at the moment can do that would make the work of anti-terrorist squads any easier," he told BBC Two's Newsnight. Fears have also been raised about intrusion into privacy but Mr Clarke said civil liberties had to be treated proportionately. "I argue that it is a fundamental civil liberty of people in Europe to be able to go to work on their transport system in the morning without being blown up and subject to terrorist attack," he said. He also said the fact the London bomb suspects were British gave "extra impetus" to understanding "radicalisation" and how people were recruited for attacks.